I am crazy about green food. Adding leafy greens to any recipe automatically boosts its appeal and health factor (to me at least!). 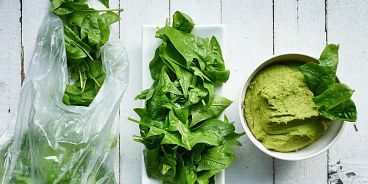 Hummus (or any dip, for that matter) is especially easier to inject with spinach, kale or parsley (my top three favourite leafy greens) and it’s quick to make if you’re in a pinch. Warning: if you don’t like garlic and lemon a lot, this may not be the hummus recipe for you.